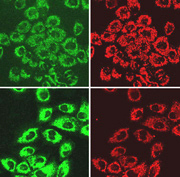 Oxidative stress is linked to age-related accumulation of cellular damage and death. To date, caloric restriction (CR) is the most robust, non-genetic intervention able to increase lifespan and to reduce the rate of aging in several animal species. However, the mechanism involved in the anti-aging effect of CR are to date not completely understood, but it seems clear that a reduction of oxidative damage together with more efficient bioenergetic processes, specially linked to mitochondria, are mainly implicated. Our main research line study the effect of CR and its mimetics such as resveratrol on the metabolic changes involved in a more efficient use of organic fuel by mitochondria and the antioxidant mechanisms involved in the prevention of oxidative damage of cellular components. The group has carried out several projects granted by the Junta de Andalucía (Consejería de Turismo, Comercio y Deporte) and also by the Spanish Ministery of Education and Science (DEP2005-00238-C04-04/EQUI, "Caloric restriction and sport performance) in which we will study the effect of CR and mild exercise in the bioenergetic of muscle and the oxidative damage produced by extreme exercise in muscle, liver, brain and plasma in mice. The main goal of the research program was to establish the mechanisms involved in the anti-aging effect of CR and mild exercise at several levels: muscle, liver, brain, etc. We also studied different parameters involved in mitochondrial activity in muscle and also several oxidative damage markers in different tissues and plasma after extreme exercise. 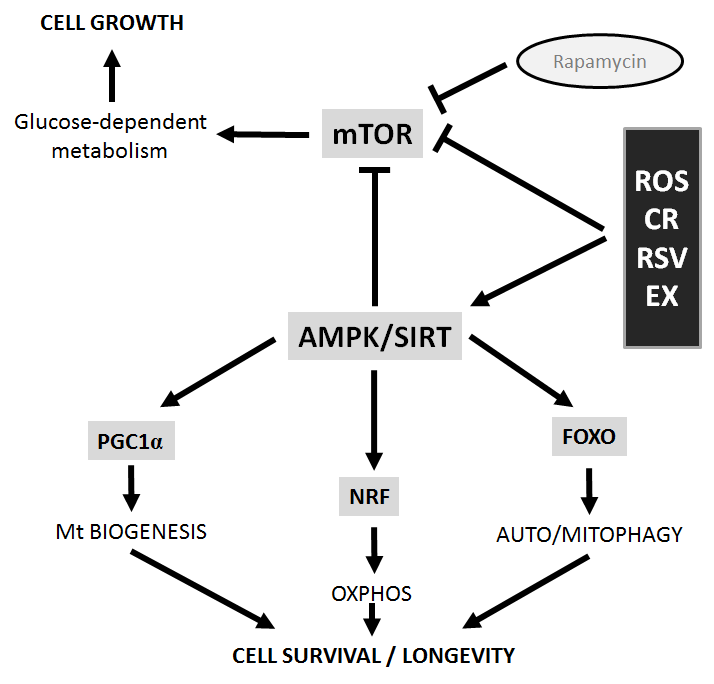 As it can be seen in figure 2, caloric restriction (CR), exercise (EX) and resveratrol (RSV) can induce AMPK and Sirtuin activities in different cells triggering mechanisms involved in mitochondrial homeostasis, oxidative respiration activation, mitochondrial biogenesis and auto/mitophagy. All these mechanisms are involved in the mitochondrial role in aging and linked to antioxidant activation during aging. We have also carried out a second project on the same subject granted by the Spanish Ministery of Science and Innovatio (DEP2009-12019). We determine if resveratrol, a polyphenol considered as a CR mimetic, can affect physiological parameters related to exe rcise and affect physical activity. The results obtained in this project are very promising and will be published soon. Taken into consideration the results obtained in the las two project involving CR or resveratrol and the response to physical activity, we proposed to determine the epigenetic mechanisms involved in the different age-dependent response found in these project. In fact, the 1st february 2013, we will start with a new project that will determine these mechanisms in CR, resveratrol and/or exercised animals granted by the Spanisn Ministery of Economy and Competitivity (DEP-2012-39985). In all these studies and another one funded by the Andalusian Government (Andalusian Centre for Sport Medicine: IMD2012SC0002) we have also studying the regulation of the mechanism of synthesis of coenzyme Q, the lipophilic electron transport member of mitochondria and the main antioxidant compound in plasma membranes in CR and the role of coenzyme Q in plasma membrane to compensate the redox equilibrium in the whole cell. This component can be importantly implicated in aging process.